Some students find it difficult to choose a college major. They are undecided about which career path to follow. Experts advise taking a close look at yourself. What sort of work would you find interesting and personally rewarding? What are your passions? One of your answers to these questions may be that you love animals. If so, there are many careers involving pets, wildlife, livestock, and other critters. Here is an overview of some of the options. Veterinarians are some of the most highly paid professionals who work with animals. They are doctors who provide a full range of medical services, from vaccinations to surgery. The stringent educational requirements are a four-year bachelor’s degree (preferably in biology, chemistry, or animal science); successful completion of four years of veterinary school; and internships and residencies that can take another one to four years (depending upon the specialty being pursued). Other careers in this field do not require nearly as much classwork and training. Support staff, like veterinary technicians and assistants, generally need only a high school diploma or GED, and an associate’s degree in animal science or veterinary technology. Programs recognized by the American Veterinary Medical Association are recommended. Some employers want their technicians and assistants to hold bachelor’s degrees in animal science, veterinary technology, or a related field. None-degree certification programs also are available. Veterinary professionals are typically based in clinics, hospitals, and animal shelters. They sometimes must work outside, in difficult conditions, such as when treating livestock on a farm or ranch. Other sites include research laboratories, university veterinary facilities, zoos, aquariums, kennels, stables, and pet stores. Animal trainers provide instruction for people, as well as their pets. Some have their own businesses, while others are employed by the film-making and television industries. Shelters, kennels, the dog- and horse-racing industries, and traveling circuses also hire trainers. There is no educational or licensing requirement. However, trainers who are also qualified animal behaviorists generally need graduate degrees in animal science and behavioral principles. Those with master’s degrees in animal behavior also may become therapists. These are advanced behaviorists, who visit animals’ homes and observe their behavior to diagnose mental and emotional issues. They also provide training for animal owners. Therapists are employed in private practice, veterinary facilities, kennels, racetracks, and other workplaces. Once simply called dog catchers, today’s animal control officers have more training than their predecessors received. They still pick up loose pets, and fine owners for violating laws and ordinances. They also inspect kennels, shelters, and other facilities to ensure safe and sanitary conditions. Animal control officers investigate reports of animal cruelty, making arrests when warranted; and rescue trapped animals. Only a high school diploma is usually required for entry-level positions. Classes in animal sciences and criminology are recommended. Police training, or experience working with trained officers, may help an applicant get a job. Shelters, kennels, stables, animal hospitals, zoos, and aquariums employ people to feed, groom, bathe, and exercise animals. Animal attendants also clean and repair cages, and alert veterinary staff when medical problems develop. A college degree is not required for some of these positions, with training provided on the job. Larger operations frequently call for degrees in biology or animal science. While grooming is part of an animal attendant’s job, some people make it their speciality. Trade schools offer training, and some groomers learn the trade by serving as apprentices. Neither a degree nor a license is necessary. One of the more advanced careers involving animals, that of the marine biologist, requires graduate-level education. These scientists work for the government, fishing operations, oil-exploration companies, animal-welfare organizations, zoos, aquariums, and marine theme parks. If your passion involves wild animals, the field of wildlife rehabilitation is an alternative. Rehabilitators retrieve sick, injured, and orphaned critters; and care for them until they are able to return to the wild. Rehabilitators work on their own, at wildlife refuges, or for shelters. Though a degree is not necessary, some classwork and certification are mandated. 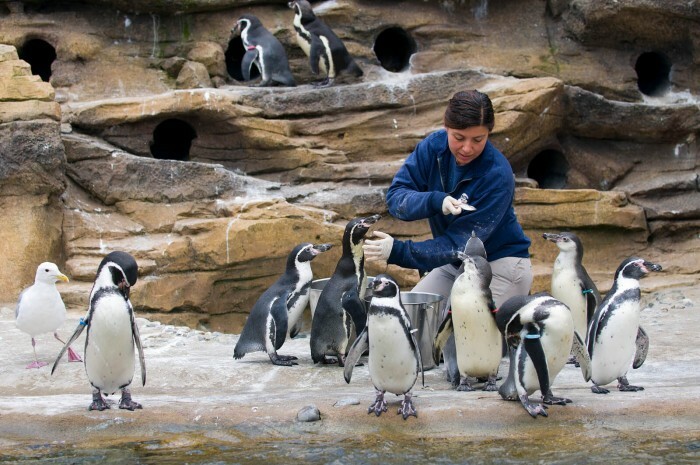 The government, animal-welfare groups, colleges, and, of course, zoos employ zoologists. These are scientists with master’s degrees or PhDs. They may specialize in basic or applied science. Zoologists, as well as wildlife biologists, study animals’ physical and behavioral characteristics, and how their habitats are affected by human activities. This list contains just a few of the many careers available for animal lovers. Other jobs entail breeding, ranching, and farming; kennel and stable management; sales of animal products and services; and wildlife photography. There are positions involving dogs, cats, horses, cows, pigs, fish, birds, reptiles, and wildlife.